The Lockheed F-104 Starfighter is a single-engine, high-performance, supersonic interceptor aircraft originally developed for the United States Air Force (USAF) by Lockheed. One of the Century Series of aircraft, it was operated by the air forces of more than a dozen nations from 1958 to 2004. The F-104 served with the USAF from 1958 until 1969, and continued with Air National Guard units until 1975. The National Aeronautics and Space Administration (NASA) flew a small mixed fleet of F-104 types in supersonic flight tests and spaceflight programs until 1994. USAF F-104Cs saw service during the Vietnam War, and F-104A aircraft were deployed by Pakistan briefly during the Indo-Pakistani wars. Republic of China Air Force (Taiwan) F-104s also engaged the People's Liberation Army Air Force (China) over the disputed island of Quemoy. The operational service of the Starfighter ended with its retirement by the Italian Air Force in May 2004. A total of 2,578 Starfighters were eventually produced, mostly by NATO members. A set of modifications produced the F-104G model, which won a NATO competition for a new fighter-bomber. Several two-seat trainer versions were also produced, the most numerous being the TF-104G. The ultimate production version of the basic fighter model F-104 was the F-104S all-weather interceptor designed by Aeritalia for the Italian Air Force and equipped with radar-guided AIM-7 Sparrow missiles. An advanced F-104 with a high-mounted wing, known as the CL-1200 Lancer, did not proceed past the mock-up stage. The poor safety record of the Starfighter brought the aircraft into the public eye, especially in German Air Force service. The subsequent Lockheed bribery scandals surrounding the original purchase contracts caused considerable political controversy in Europe and Japan. NASA operated Starfighters were designated F-104Ns. These planes were German built F-104Gs with all the armament and combat avionics removed. They were used for training and chase planes. One was destroyed when it collided with the XB-70, causing both aircraft to crash. As one might expect, this is pretty much your standard Hasegawa F-104G but without any weapons pylons required. The kit does come with tip tanks and these are needed for one of the options. The cockpit is well appointed with decals that can be used atop the raised detail on the instrument panel and the side consoles. A resin seat or perhaps a seat harness set would add a lot. Tshe fuselage is split vertically and has the fin/rudder molded in place. The wheel wells utilize vinyl plugs to hold the landing gear in place. Personally, I'd rather glue them, but at the time of this kit, that was the rage. Intake trunking goes back about an inch or so and then stops against a plastic wall. Thanks to the design of the real intakes, little can be seen in there anyway so that is more than adequate. For the exhaust, there is the final compressor stage and a full afterburner interior. The burner petal assembly can be installed at the very end of the build. Wings are two pieces and have separate flaps, ailerons, and leading edge slats. These were normally up when the plane was on the ground. The kit does have the proper wider main gear and bulged gear doors for this version. The speedbrakes can be posed open, but again, these were normally closed. The windscreen, canopy and backlight sections are all separate and though there is no canopy mechanism, this can be posed open if you so wish. 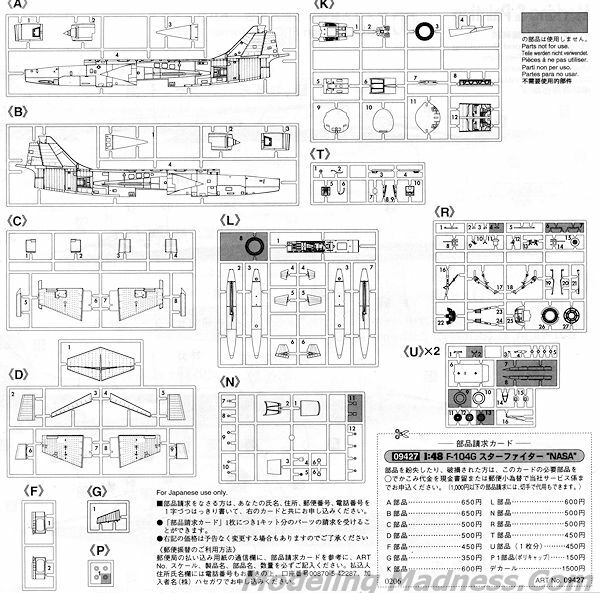 Instructions are typical Hasegawa and provide Gunze paint references. There are three markings options. First is from 1970 with a da-glo tail and wing tips, grey wings and aluminum fuselage. Next is from 1980 with an all white upper fuselage and wings, along with a light blue lower fuselage. This blue will need to be mixed. The big blue stripe is part of the decal. The last is from 1985 shortly before the type was retired. It is all white with the big blue stripe along the side as shown in the box art photo, taken at NASA Dryden's aircraft display park. The very large decal sheet fills the bottom of the box in length and is too long for my scanner. It is printed by Cartograf so is of very high quality. This is another nice boxing of Hasegawa's 1/48 Starfighter. If you have ever built thiskit, you know how nice it is and with the usual careful building, you'll have a real beauty. Despite the age of the markings, I would bet that they'll still be viable. Another option is the old Victory Productions F-104 sheet that offers several slightly different NASA Starfighters.